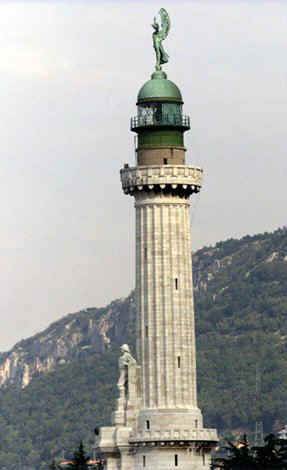 The Trieste's Victory lighthouse, an impressive work of the triestine architect Arduino Berlam (1880-1946) and the sculptor Giovanni Mayer (1863-1943), has two important functions. 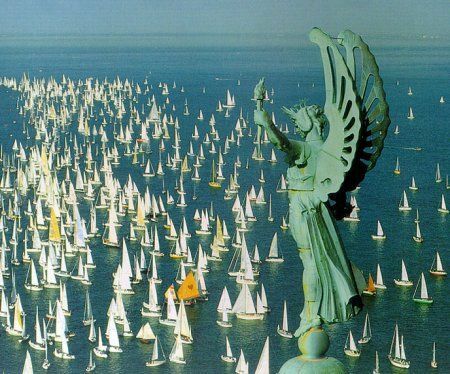 Besides lighting the Gulf of Trieste, in order to help navigation, it is a commemorative monument dedicated to the fallen of the first world war, as testified by the inscription: "SHINE AND REMIND OF THE FALLEN ON SEA MCMXV-MCMXVIII". The idea of building this lighthouse arose already in 1918. The Mount of Gretta was chosen since it provided a very good emplacement at 60 m. above sea-level and solid foundations in the round earthwork of the former Austrian fort Kressich, built between 1854 and 1857. The lighthouse is made up by a large base that includes the earthwork of the Austrian fort and, externally, is covered by blocks of stone from Carso and from lstria. Above the column there is a "capital" that supports the "crow's nest", so defined with a clear reference to the ship mast, in which is inserted the bronze and crystal cage of the lantern covered by a copper dome decorated with a scale-like motif. The top of the dome is surmounted by the daring statue of the Victory made of enbossed copper and weighing about 7 hundred kilos sculpted by Giovanni Mayer. The ornamental part is completed by a powerful sculpture of the seaman, made by Giovanni Mayer, which was carried out with 100 tons of stone from Orsera. 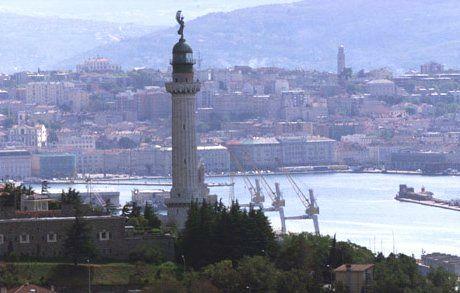 Under this statue is affixed the anchor of the torpedo-boat Audace (the first italian ship that entered the port of Trieste on November 3, 1918), donated by the admiral Thaon di Revel, Navy minister, together with two projectiles of the Viribus Unitis, placed on both sides of the lighthouse entry. The lantern stand at about 130 meters above average sea-level and it is made up by a lighting body of an average power of 1,250,000 candles with a range of 34 - 35 nautical miles, The optical engine completes a rotation around its axe every 45 seconds. The works, which started in 1923, ended on May 24, 1927 with the inauguration in the presence of King Vittorio Emanuele III. The impressive structure of the lighthouse, which weighs 8,000 tons in all, involved the use of 1,300 m3 of stone from Orsera and Gabrie, 2,000 m3 of concrete, and 11 wagon-loads of iron corresponding to 100 tons. 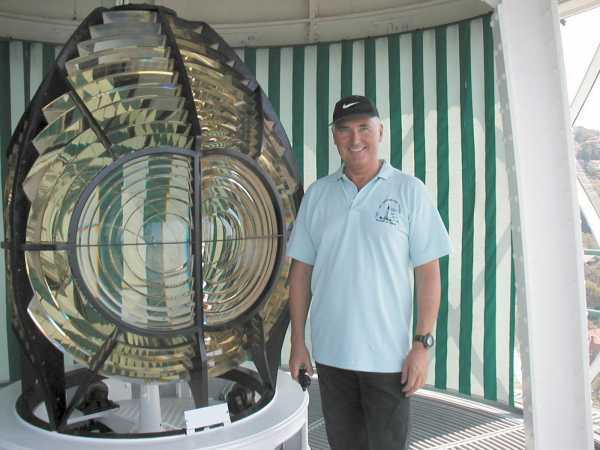 This Lighthouse Keeper's Webring site owned by A.R.I. Trieste.